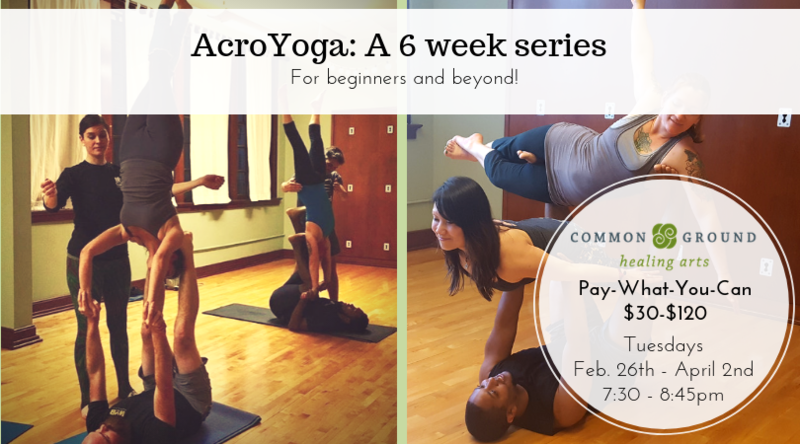 Click here to sign-up for AcroYoga! AcroYoga blends partner yoga, acrobatics, and Thai massage to explore balance and connection with others. Learn poses and transitions in a safe, controlled manner as you unlock your inner child. No experience is necessary. We will start with the basics and use progressions to build up to certain skills. For those who have more experience with AcroYoga or are looking for a bit more of a challenge, we will also offer variations of progressions that require a higher skill-level. Bring your questions, curiosity, and any reservations you might have. People are often nervous to try AcroYoga for the first time, but we’re here to keep you safe and help you experience this fun, invigorating practice! This course will be offered on Tuesdays, 7:30-8:45pm from February 26th – April 2nd. This series will require a minimum of 6 people to be signed-up. If we haven’t hit the minimum we will contact those already signed up so that we all have chance to recruit a friend or two in the last few days! Please note: No substitutions. Cancellations for this series must be made at least 24 hours in advance of the first class, refunds will not be issued after this point. Refunds are not available for missed classes. About Eugene: Eugene Perry’s journey through motion brought him to AcroYoga when he was introduced to it by Danielle Lagana. He’s been trained by Ian Nathan and Danielle. Eugene has attended various 3 and 4-day AcroYoga intensive workshops including AcroShare, AcroLove, and Capital Flightfest. Eugene is dedicated to creating a safe environment so that others are encouraged to explore their movement and balance.